Since 2012, all new buildings constructed at Bucknell University have been designed in accordance with the U.S. Green Building Council's Leadership in Energy & Environmental Design (LEED®) standards. With the renovation of the Carnegie Building, completed in December 2015, the University sought for the first time to extend its commitment to sustainable development to a renovation project. In August, Carnegie attained LEED certification, joining Academic West, the Kappa Delta Rho and Lambda Chi Alpha houses, MacDonald Commons and the South Campus Apartments as the sixth LEED-certified project on campus. The University is also seeking LEED certification for the new Graham Building and the renovation of Roberts Hall, both completed this summer. 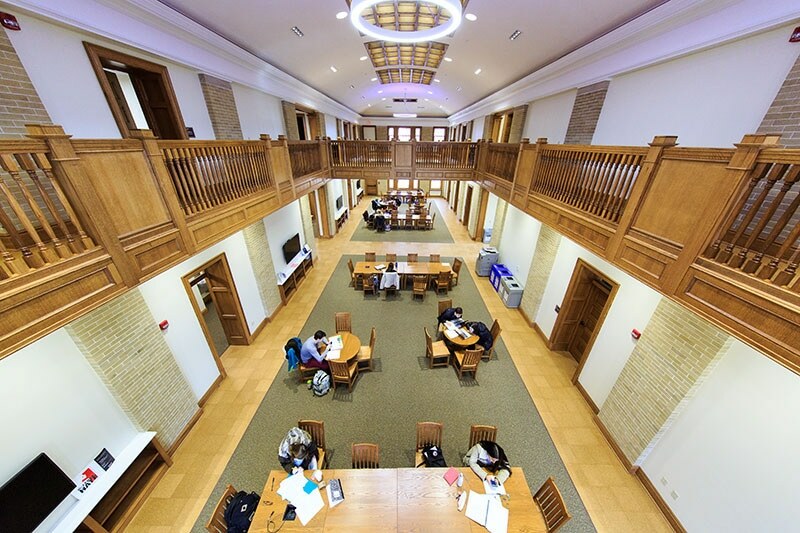 The yearlong, $7 million renovation of Carnegie restored the building's sky-lit, two-story central atrium, which was designed by Bucknell President John Harris and served as the reading room when the building opened as the University's first dedicated library in 1905. The surrounding space was reconfigured to house student and faculty support offices, including the Writing Center, Teaching & Learning Center (TLC), Office of Accessibility Resources and the Griot Institute for Africana Studies, as well as geology department laboratories and a classroom. Incorporating LEED construction standards into the renovation project presented unique challenges and forced planners to balance sustainability goals with historical accuracy, as well as the need to make the building ADA compliant, according to Dominic Silvers, senior project manager for Bucknell Facilities. A true restoration project, for example, would have refurbished the building's original single-pane windows, rather than replacing them with more energy-efficient modern inserts, as the builders ultimately did, he said. "In all projects, we're doing what's right for Bucknell as a whole, for the building to best suit the University's needs," Silvers said. "I think we achieved a high level of accessibility, restoration and sustainability. This project is a great example of how all three of those needs can be balanced to create a functional building that's really a showpiece for the University." The Green Building Council confers LEED certification at four levels — certified, silver, gold and platinum — based on factors such as the use of recycled materials, measures for reducing water consumption and fixtures that optimize energy use, as well as more holistic elements such as development density and community connectivity. Sustainable features incorporated in the Carnegie renovation include insulated glass windows, insulation in the walls and roof, occupancy sensors for lights and HVAC systems in offices, a heat recovery unit, low-flow water fixtures and LED light fixtures, as well as the use of regionally sourced construction materials and 10 percent recycled material. The University has also purchased wind power credits to account for 100 percent of the building's energy use for two years. The fact that the project was a renovation was itself a challenge for project planners, given that nearly a quarter of points used to determine LEED certification — 26 of a possible 110 — concern site selection. But it also allowed Bucknell to earn points for reusing existing material, said Amy Smalt, the Bucknell campus planner and a LEED-accredited professional. "They say the greenest building is the one that you don't build," Smalt said. "We got points for the mere fact that this is a renovation — that we were able to maintain existing walls and floors." The project reused 84 percent of existing structural elements, such as interior and exterior walls and floors. To make the building ADA-compliant, for example, construction crews removed a brick stair tower on the side of the building and replaced it with an elevator tower. They then reused those bricks to replace crumbling masonry elsewhere in the building. "That doesn't fit neatly into a category, but it's something we did that's very sustainable, and also helps us from a historical standpoint," Silvers said. "It's one area where all of our priorities fit together." As pleased as the planners are with receiving LEED certification, they say they're even happier that the project, together with the renovation of Roberts and the green space between the two buildings, has brought what was once the center of campus back to its former prominence. "We were pleased with how quickly the space came into use," Smalt said. "It wasn't long after we opened up the building that we found students in here studying."